Building a strong brand image has always been important to the success of businesses big and small. Your brand image is reflected in every aspect of your business, from your mission statement to your customer service and everything in between. However, in the digital age how can you utilize the power of branding to stand apart from your competition in the eyes of your customers? For the aviation industry, it’s simple. 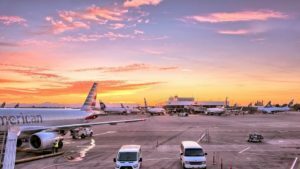 Aviation firms work tirelessly to increase their customer base while nurturing relationships with existing customers in order to build and sustain customer loyalty. In an industry designed around customer comfort and convenience, maintaining a strong brand image is fundamental to success. According to the American Marketing Association (AMA), branding is defined as: A customer experience represented by a collection of images and ideas; often, it refers to a symbol such as a name, logo, slogan, and design scheme. Brand recognition and other reactions are created by the accumulation of experiences with the specific product or service, both directly relating to its use, and through the influence of advertising, design, and media commentary. Think about some of the most renowned companies in the aviation industry: Delta, Boeing, JetBlue, etc. They are all leaders in their field, and achieved this status by incorporating a strong brand identity into every aspect of their business. Below are a few strategies that will help your company strengthen its brand identity. 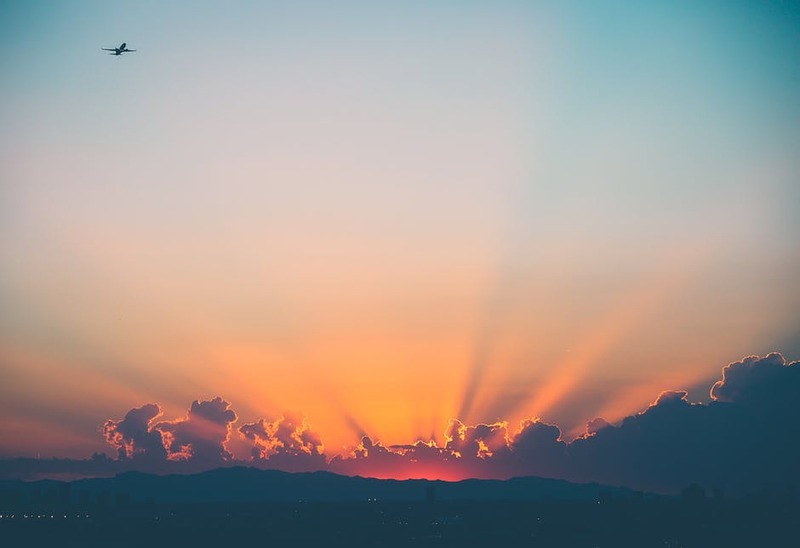 Whether you are in the aviation industry or not, evoking positivity through your brand image is important. This can be accomplished through word choice, colors, and the fonts you choose for the company’s logo or advertisements. 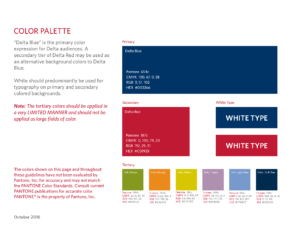 Think about Delta’s brand identity. Its logo is unique and has a memorable font with a distinct pop of color. 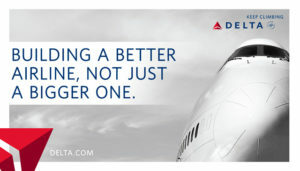 Its slogan, “Building a better airline, not just a bigger one” tells customers that Delta isn’t just in it to make money. The slogan relays Delta’s hope of a positive travel experience for every customer choosing to fly with them. One of your best tools when creating a company identity is creativity. Creativity drives innovation and can lend in developing a unique brand identity. Showcasing your creativity through use of color or word choice gives your organization a personality, something that many firms lack. When a consumer sees your logo or slogan they should immediately recognize that it belongs to you. When choosing a brand name or slogan, be sure to employ a structured creative approach. Of course, you should avoid using words or phrases that are already associated with other brands. Uniqueness helps your business stand apart from the competition. A creative logo or slogan shows customers what your creative capabilities are. If your branding reflects the individual personality of your organization, your target audience is more likely to notice, and ultimately buy from you. When building a brand identity, include the same color scheme and font on all of your products, packaging, and logos. Consistency strengthens your brand’s identify overall and helps to avoid confusion with other brands. Repetition is vital to branding. The more your customers see your logo, colors, and font, the more likely they are to recognize your brand when they are exposed to it. Seeing consistent branding on various materials (e.g., brochures, eBooks, blogs) and on all marketing channels (social, TV, radio) helps customers connect with your firm. According to a study by Microsoft Corp., the average human attention span is a mere 8 seconds. Therefore, when developing logos, brand names, and slogans for a brand identity, it’s a great idea to keep any copy to a minimum. Think K.I.S.S. (Keep It Simple, Stupid). If any of your branding elements include too much text, potential customers are unlikely to read it. By keeping your slogans and brand names short and sweet, you can create a strong, clear message of your brand and increase its chances of being remembered by your target audience. Not all brand building includes writing witty slogans or using the right amount of words. Your logo should be visually appealing regardless of any words attached to it. In addition to internal staff designing what they feel is visually appealing, you will want to test your design on potential customers in a focus group setting. Think about color schemes, images, and overall design when creating a brand identity. In addition to using these design elements for your logo, also include these design elements in all of your product packaging, advertising, merchandise displays, and even in your physical office space. As I stated before, consistency is key in branding. A strong brand identity is essential for a company to gain recognition and build customer loyalty. Developing the right brand image takes research, time, and meticulous care. 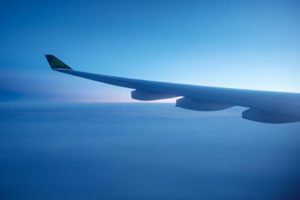 However, the right branding strategy can transform aviation firms seeking to stand out in this competitive industry. We’d love to hear from you! What are your tips on creating a unique brand image? Comment below with your brilliant branding tips.